Taking to social media the general public vented their frustration and even hurled insults at Minister of Public Enterprise and Development Kabir Hashim, after a video footage of him addressing the management of SriLankan Airlines went viral. 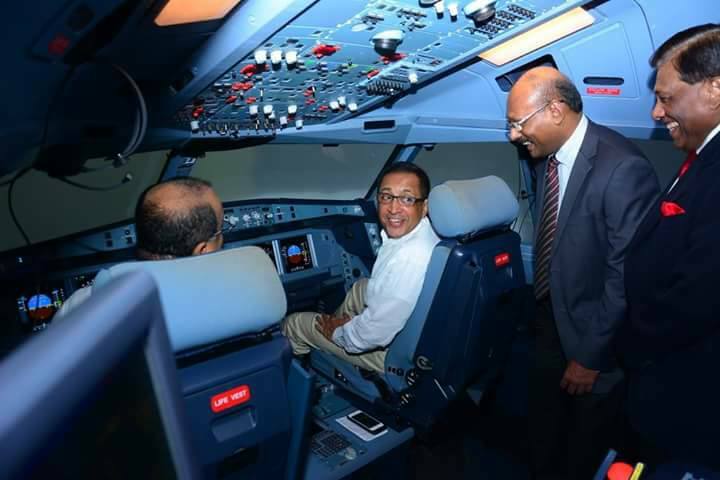 This was after Minister Kabir Hashim visited the offices and the training facilities of SriLankan Airlines in Katunayake a few days ago and went on to tongue lash and blame the former Rajapaksa led regime for the catastrophic losses it incurred when managing the national carrier. The contents of Minister Kabir Hashim’s speech, where mere words regarding the national carrier have been now echoed by the current yahapalanaya government over the last two and a half years with no action taken, are the strong sentiments stated in many comments uploaded especially on Facebook. Venting his frustration a commentator named Capt. Lalith Wijetunge, a former employee of both SriLankan Airlines and Mihin Lanka posted on Facebook saying ” Yes but nothing seems to have happened to turn it around Mr Minister. The corrupt guys are still in whilst the rest are out! Just look at the board and some managers including HHR ! A silly joke”. This is mainly due to the non-committal stance employed by the President Sirisena – Premier Wickremesinghe led government to date, especially after the airline was thoroughly investigated by a ‘Board of Inquiry’ led by Lawyer J.C. Weliamuna and his team in February and March of 2015. The Board of Inquiry made several recommendations including the criminal prosecution of the former Chairman Nishantha Wickremasinghe and CEO Kapila Chandrasena, besides naming many employees who strangely are still employed by the airline. However current Chairman Ajith Dias and CEO Capt. Suren Ratwatte earlier went on to state that the ‘Weliamuna Report’ carried no weight, as there was not sufficient proof in the ‘Board of Inquiry’ Claims. After been taken for a joy ride in the Flight Simulator Minister Hashim then gathered the management of the airline and went on to say “I am always questioned by the opposition as to what we are going to do with the national carrier. They kept on asking if we are planning to sell it. I always said that there is nothing to sell. The only option we have is to bury it. But President Maithripala Sirisena and Prime Minister Ranil Wickremesinghe’s have given me instructions to resurrect this airline. The previous government wasted funds on spending money for banners during their political campaigns. We have not taken a red cent from this airline for any of our political events. They even spent monies sponsoring the famous nights races and Carlton rugby sevens. But the airline’s unions kept mum about those things then. The former Chairman was provided with three houses by the airline. How could he spend one night in three houses? He was also provided with six mobile phones. They even ordered eight Airbus 350 aircraft for millions of dollars without any strategic planning which destroyed your airline. The total loss they incurred was Rs 461 billion or US $ 3252 million. That is the cost equivalent of building five highways in the country”. Meanwhile in another unique first, the International Aviation Academy has now implemented a ‘cash for jobs’ strategy, especially for those who wish to join as Cabin Crew. Despite the airline conducting its own training programme for all new Cabin Crew recruits, the IAA run by General Manager Primal De Silva forces those who wish to join the airline as Cabin Crew to pay nearly US $ 2000 and follow a Cabin Crew programme. This has now been made mandatory if anyone wishes to secure a much cherished job. The quality of this new venture was shockingly experienced a few weeks ago, when 27 out of a batch of 58 Cabin Crew granted full time employment through the IAA as Cabin Crew, failed SriLankan Airlines’ Safety and Emergency Procedures examination. A Cabin Crew Safety Instructor speaking to Colombo Telegraph on condition of anonymity as he is barred from speaking to the media said “This was quite embarrassing. Firstly the IAA led by GM Primal De Silva insisted that we reduce our Safety Training days as students are now forced to follow two sets of courses. The management then asked us to prepare a rather simple Safety and Emergency Procedures examination paper in order to ensure that we somehow pass these 27 failed students. We were given no choice and we had to do it. Mind you even after making a simple test paper, three students still failed that test too. Issues like this have never been experienced in our airline’s history. This is nothing but a blatant violation of Flight Safety. I hope this exposure will be taken seriously and a complete stop to this nonsensical IAA recruitment process of Cabin Crew takes place immediately”. Earlier SriLankan Airlines had refused to employ the children of Cabin Managers Gehan Perera and Jainudeen Cuttilan, stating that they did not meet the height criteria for Cabin Crew recruitment by a few centimeters.